Utah Concert Review - Page 14 of 14 - Relive the Utah concert experience! How many of you can remember when you heard The Beatles for the first time? My guess if you’re under the age of 50, you don’t recall that moment of in your life. They have just been a part of your life from the beginning. I imagine as it is with me, you’ve heard, loved, and appreciated not only the greatest of The Beatles but also enjoyed Wings and Sir Paul solo hits. Now imagine this lifelong soundtrack wrapped up in one 39 song, 3 hour concert. That is what those of us who were fortunate enough to attend Paul McCartney’s recent concert at Energy Solutions Arena were blessed with. He covered it all. The lights dimmed and The Paul McCartney walked on stage right at 8:30 PM. The crowd rose to their feet and the arena was as loud as I’ve ever heard it. Sir Paul didn’t say anything, he just waved, strapped on his iconic violin bass guitar, and opened the show with Beatles favorite “Eight Days a Week”. I didn’t think the crowd could be any louder, but when that song started the crowd volume rose even higher. On a personal note, I’ve been trying to see Sir Paul since I was a senior in high school. Now we don’t need to get into how old I am, but let’s just say, if someone was born the day I first started trying to see this man in concert, they could have easily bought a beer at last nights show. It’s been a long time coming. So when Sir Paul walked out, and I was seeing him with my own eyes, and hearing one of my favorite songs live, I will admit, my emotions got the better of me. Music means so much to me, and this man’s music has not only influenced me, but influenced so many other bands and artists that I love. To have now have him directly in front of me was almost too much to take, and almost impossible to believe. I think I still have pinch marks on my arm from the continual reminders that this night was real. I’m sure for many reading this, that’s a little much. But for those who share my feelings, I know you get it. Paul McCartney mixed his set list with an artistry that I think other bands should take a look at and apply to their setlist decision process. Paul has a new album out. It’s pretty good. But I don’t imagine people went to this show to hear the new album (conveniently named NEW). He was able to sneak in 4 songs from his current album, because he sandwiched them between Beatles songs, or a Beatles songs and a Wings song. But we were never left sitting there dying to get to the next big song from the catalogue we came to hear. He got to it. Did he ever. The thing about The Beatles, is just with Sir Paul’s songs alone, we could have been there for two more hours. But the cool part about that is he would do songs that we may have not expected. Songs like, “I’ve Just Seen a Face”, “Lovely Rita”, or “ Ob-La-Di, Ob-La-Da “, or Wings hits like “Hi-Hi-Hi” and “Let Me Roll It”. All of them came as a pleasant surprise to the crowd. Almost like an “Oh yeah, I love this song!”. I don’t know how he decides on his set list. There are so many great songs to choose from. Normally a band has at least ten songs they have to play, and then they play maybe five or six off the new album, then maybe five others of their choosing. Sir Paul has so many songs he can’t do that. It’s no wonder his shows go almost 40 songs deep. While I would say the majority of the audience were Beatles fans from the beginning, there was a good mix of young and not so young. I’m not a fan of sitting down at concerts, but the show was so good, I couldn’t let it bother me that we sat for a good portion for the show. But again, the show was 3 hours long. Most of these people haven’t stood for three hours straight in at least 25 years. But when the time was right, we were all on our feet dancing to this amazing music. I had the benefit of sitting behind a man who undoubtedly watched the four lads from Liverpool appear on the “Ed Sullivan Show” for the first time, and in front of two teenage guys who most likely have no idea who Ed Sullivan is. I could see the man in front of me sing every word to every classic song as if he was back in his teen days himself. I was ultimately impressed with the teens behind me. They were singing right along to every song Sir Paul performed. Even songs from the new album. Impressive! One, that they were such huge Paul fans at such a young age, and two, that I could actually hear their voices over the beautifully loud, and perfectly mixed music. When I realized I could hear them, I quickly apologized to the dude sitting in front of me if my voice is ruining all of the videos he had taken with his camera phone. But to be honest, I didn’t care. I can’t remember the last time I sang out so freely and danced as if no one was looking. For those listening or looking, you’re welcome. Also, don’t steal my sweet moves. I feel like the four luckiest people in the world, are the men who compile Sir Paul’s touring band. Yes, they are extremely talented, and add a nice freshness to these songs. Buuuuuut, they are touring with Paul McCartney! There are a lot of really talented musicians out there. They must love their jobs. And to their credit, they really are great. I’m sure there is a reason Paul has picked them, and played with them longer than any other touring band he’s had in the past. Paul did a solid job of giving tribute to his fallen bandmates, John Lennon and George Harrison. He sang the songs “Here Today” , which is a song he wrote after John was killed. The song is in the form of a conversation that he wished he would have had with John before he died. If you haven’t heard it, go right now and listen. I’ll wait… Ok, pretty great right? Such a beautiful tribute. I can picture that conversation just by listening to that song. He gave tribute to George, by sharing with us that George was a really good ukulele player. And he began one of George’s biggest hits “Something” with just him and a ukulele. The band joined in to finish the song, and I’m sure George would have been proud of this version. It was a special moment in the show for sure. He paid two more tributes playing “My Valentine”, a new single off the latest album to his current wife Nancy Shevell, who was in attendance. Then he played “Maybe I’m Amazed” to his late wife Linda. It was as if he was letting us into his personal life, if only just a little bit. 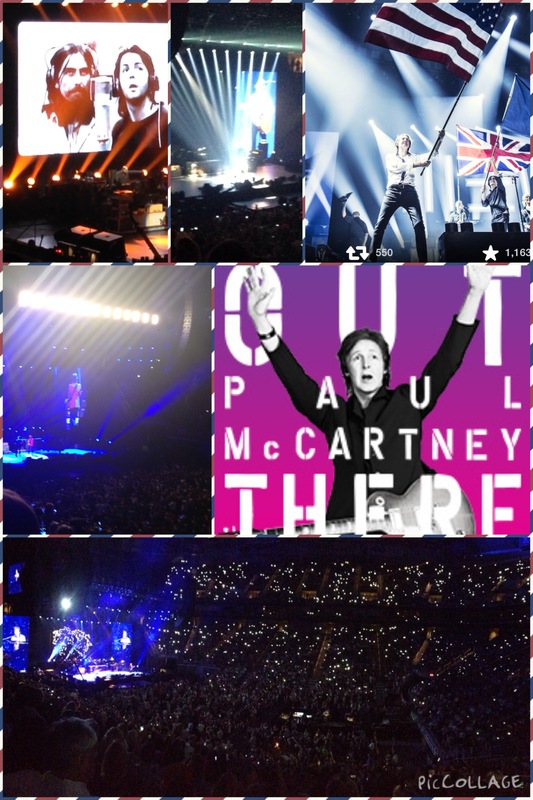 Sir Paul has been performing for over 50 years. For some, this makes them less enjoyable to watch. Either there voice is shot at this point, or they are just going through the motions for a payday. But while Paul’s voice at times shows the wear of touring, he has complete control of his it, and it sounds at least 20 years younger than his age of 72. And going through the motions he is not. At least not in a way that we can tell. He’s still having fun. He made jokes to the crowd, told stories of Jimi Hendrix and Eric Clapton, and even tried to read some of the signs people had brought. He told us “I think we’re going to have a party tonight!”. I’m sure he says that wherever he goes. But it was true. Party we did. He said at the end “You see, I told you we’d have a party.” Again, he probably says that a lot. But he doesn’t do the typical throw in the name of the city in between every song for a cheap applause. He probably mentioned Salt Lake City or Utah three or four times at most. Paul McCartney does not need cheap applause. Now I’ve seen a lot of Paul McCartney concert footage over the years. He mixes it up, yes, but there are a few highlights that I was eagerly anticipating. But when they happened in this show, they snuck up on me. The pinnacle of course being “Hey, Jude”. You guys, I have been dying to sing “Na Na Na Nana Na Na Hey, Jude!” for so long that when it came, it was almost like an out of body experience. The only reason I knew it was actually happening was how thrashed my throat felt when the song was over. The song went almost ten minutes, and the crowd never died down. It was amazing. Amazing isn’t even the right word. I don’t know if the right word exists. But, just, wow. Paul finished the show with two strong encores, and if we thought he’d come back again, I know the crowd would have asked him back. I think the building could have been powered by the energy of that audience. We all knew we were part of a special moment in time. This wasn’t a nostalgia show. Sure, we were taken back to whatever time it was when we first heard these songs, but it was more than that. When you go see Journey, or the “final” Motley Crue show, that’s for nostalgia. Going to see Paul McCartney is a history lesson. You go to tell people you saw the living member of the best songwriting duo in rock n roll history. You go to bridge the gap between the music your parents grew up on, and what your kids listen to now. You go to be part of a moment with 17,000 of your new friends. I have struggled to put into words just how I felt at last nights concert. How do you describe a dream come true? How do you explain inspiration personified? He is just a man after all. But I believe he’s one of the good ones. You don’t have to love Sir Paul like I do. You don’t even have to be a Beatles fan. I think you’re nuts if you’re not, but I can accept that not everyone is going to feel the way I do. But there is no way to deny this man’s place and influence in music history. As I returned home, I sat looking at my phone and watched the three songs I recorded. ( I hate doing it, but i just couldn’t help myself!! Damn you modern technology!) I sat reliving the moment I just experienced over and over. I slept very little because each time I’d start to doze off, I’d remember something I liked about the show and I’d get so pumped up it would be another hour before I got sleepy again. But, surprisingly I’m full of energy and basking in the glow of Beatlemania. I think it’s pretty obvious by the perma-grin on my face that I would highly recommend this show. To anyone! It amazes me, after all the concerts I’ve been to in my life, and the amount of time I’ve waited to see this particular one, that it could still exceed my expectations the way it did. I can easily say, it was the greatest concert experience of my life. Thank you Sir Paul. Thank you so very much! A friend of mine won tickets on the radio to the recent Lady Gaga concert at Energy Solutions Arena, and invited me to go with. I’m sure it’s surprising to some that I said yes, and not surprising to others that I accepted the invite. Just to put it out there, I do enjoy Lady Gaga’s music. I don’t know if I’d consider myself one of her “Little Monsters” (what she calls her dedicated fans), but I have downloaded a number of her songs, and cut a few rugs listening to her jams. I never in my life thought I’d be seeing her live, but the moment and opportunity came. It’s been really hard to explain what I saw, because there was so much going on that my eyes couldn’t take it all in. First of all, the people watching was at an all time high. Interesting make up, colored hair, platform shoes, g-strings, leather chaps, and that was just one dude. There were so many unique looks again, my eyes couldn’t capture it all without appearing to stare at people. And I was always taught that staring is rude. But I think in this case it was probably ok, even welcomed. When it comes down to it, I probably stood out as the oddly dressed weirdo. And I was in jeans and a polo shirt. The one time I don’t go shirtless with a bowtie and booty shorts! Lesson learned. When Energy Solutions Arena was built, I’m pretty sure they forgot that bands might tour through Utah and want to play in a big venue. The sound is probably the worst in any large arena that I’ve ever been in. Which is why I have to compliment the sound engineers on this tour. They mixed the show perfectly. Which is no small task at this venue. The set design was amazing. The staging looked as if we were in Greece, or maybe even Jerusalem. All the band members were nicely placed in their own little houses. The catwalk was all over the place. On one side of the stage it reached all the way across the arena floor and curved to form a bar for the 21+ general admission to buy adult beverages without having to leave the floor. Smart move Lady Gaga. On the same catwalk was what looked like Superman’s Fortress of Solitude, but it turned out to be one of Gaga’s hidden piano’s that she would be using later in the show. The other catwalk went about halfway down the other side of the arena floor, with a bridge connecting the two. In the middle of the shorter catwalk was a large circular platform where a lot of dancing would be done, as well as a huge chair designed as the monster claw her fans make. Gaga would sit in this later in the show and it would raise up about 20 feet in the air. There were a lot of hidden surprises in her staging, such as trees and flowers growing from out of the stage and catwalk. My seats were not that great (sweet radio station winnings), so sometimes I felt like I was watching people watch a concert. But only a few times. For the most part, it didn’t matter how high up, or how close any of us were, we were all part of the show, involved in the experience. The show started with Gaga’s 14 talented dancers spreading out over the catwalk. And Lady Gaga raised up from the stage floor. Before she appeared, it seemed as if the upper bowl would be sitting for most of this show. But when they saw her, not only did they stand up, they went nuts! I cannot express how into this show her audience was. Hands in the air, dancing the whole time, and singing a lot at the top of their voices. They were singing every word from songs that were not singles from her albums.These fans absolutely love her. She strutted the stage and catwalk in perfect time. Every step was choreographed, yet, it seemed totally natural. She told us that tonight was “A celebration of love, freedom, and being yourself.” I couldn’t tell if she had back up singers, or if her harmonies were just back tracks, but whatever there was, it sounded good. And her vocals were amazing. She would scream out at the audience, and then sing these beautiful notes. I don’t know how she does it. She’s dancing the whole time, yet can still sing live. I was winded just walking to my seat. Granted, it was four rows from the top, but when I saw what she was doing, I was embarrassed. I’m sure there were times she was singing along with tracks, but I can’t blame her. She was moving around the entire show. While she was singing an acapella version of “Edge of Glory” she stopped in the middle and said, “Man, the altitude in this place just kills me! I mean, how you do guys breath here? With the smoking and the drinking, and this altitude? You’re superstars, that’s why.” It was pretty funny. The amazing thing is right after she says all that, she hits the highest note of the song. I was impressed. Say what you will about Lady Gaga, but she can captivate an audience. She gives you everything she has. This show didn’t sell well. I imagine in other towns this show was an instant sell out, but here there were a few areas where they curtained off unsold seats. I was worried that would bring down the show, or maybe Gaga and her crew would just show up, do some songs with lower energy, and get out. But this was not the case. She left it all out there. Literally. All of it. There was one point towards the end of the show where she was dancing like crazy, stops, vomits, then goes right back to dancing even harder! (I’m not going to post it, but it’s online. Feel free to take a look.) It was unbelieveable. When she came back for her encore she apologized for getting sick. And she said she wasn’t trying to do any “performance art” tonight. I imagine she was referring to a controversial show she did at the SXSW festival in Austin, Texas where she had “Vomit Artist” (Meaning, she drinks paint, then pukes it up on a canvas to make art.) Millie Brown, vomit on her. So this wasn’t that. She had just pushed herself too far. I’m sure the altitude, and the nonstop dancing and singing got to her. The crazy part is she comes out for her encore and kills it on her final song “Gypsy”. If I vomited during a performance I’m pretty sure there wouldn’t be an encore. But Gaga is dedicated to her fans, and they are absolutely devoted to her. This show is not for everybody. That is for sure. But I’ll tell you what, if anyone wanted to come to this show, all would be welcomed. I don’t think I have ever been to a show where there was such an open minded, accepting and free spirited atmosphere. I saw people who in another setting would be reserved, let loose, and just let it go. Gaga set the precedence early on that this was a safe place, and that people could just have a good time and not worry about being judged. And the fans went along with that. It was great. They had complete command of this crowd. There was a time where she asked people to put away their phones, and just be in the moment. And would you believe it? The phones went away for a while. I didn’t think that was possible in this day and age. I think Lady Gaga feels safe in this environment as well. She knows the people there are with her, and her perceived “weirdness”. Here she is not weird. She is the leader, and inspirer of those that feel rejected, and misunderstood. In an arena show, if you’re not close, it’s easy to feel distant from the action and not part of the show, but other than Bono from U2, I’ve never seen an artist engage with the audience in such a way that makes an arena feel like a small club. And if anyone with reading this knows me, they’ll know that that is high praise from me. But she in fact did that. She has that kind of power. I have to say, it was inspiring. I had a great time at this show. I don’t know if I have anything critical to say about it. If I was going to say anything, I would say she left a few hits off of the setlist. And she only did a slow version of “Born this way” and an acapella version of “Edge of Glory”. But the show was so fast paced and electric, and fun that it wasn’t until I was walking out that it even came to mind. The staging was amazing, the lighting was perfect, the sound was well done, and the costumes were creative, interesting, and multiple. But even without any of that, I think Lady Gaga is an artist with endless depths of talent. She knows what she’s doing, and why she’s doing it, and for so many, it’s working. And who knows, maybe there is a “Little Monster” in me after all. I was introduced to Sara Bareilles only a few years ago, when my sister and her husband went to see Sara at the Palladium in Los Angeles, CA. My sister being a huge fan, strongly encouraged (forced) her husband to go. But he like I imagine so many other men, came away very impressed. Sara has a huge female following and because of that, many men seem to feel like she is not for them. I think because she is such and honest songwriter, men may feel that because they are coming from a female’s perspective, they are not relatable songs. I’ll admit, I was of that belief as well. But when I spoke with my brother in law after that L.A. show, he came away very impressed. He came away a fan, and coming from a someone who is into Social Distortion, that says a lot to me. I thought, maybe I should give Ms. Bareilles a second chance. So I went to youtube and searched around, and came across Sara in concert singing a cover of Coldplay’s “Yellow”. Which is a song I very much like. If you haven’t heard this version, do yourself a favor and give it a listen. I know this sounds dramatic, but it honestly gave me chills to the point of almost getting emotional. Weird right? Well, maybe not. Sara Bareilles version of Yellow is simple, yet beautiful. So, after hearing that voice, I was hooked. Now, fast forward to last night. Initially I was very surprised that this concert was not sold out. I easily walked up to the box office and bought a ticket just as the final opener was finishing her last song. Then I remembered that the concert was on a Sunday. With the large Latter Day Saint population in Utah, who generally speaking do not go out on Sunday, it was no surprise that the show was not sold out. I have no doubt that if this concert was held on Monday night, it would have been sold out months ago. With that being said, it’s not like there were 50 people there. I asked the box office what the attendance was, and they told me there were around 2,000 in attendance. The Saltair holds 3,500 so the place was plenty full. The Great Saltair is an awesome place to see a concert. The whole place is general admission with a 21+balcony that wraps around the entire venue. Also, it’s so fun to see an artist in a more intimate venue. I love a good arena or stadium show, but give me a small venue anyday. Now, I’m not an expert on acoustics, but I have always loved the sound inside The Saltair. And tonight was no exception. Sara’s beautiful voice soared fantastically through those old wooden beams. Her band was mixed perfectly, and they were exceptional in every way. Sara came out and the crowd was deafening. She opened with “Little Black Dress”, a song from her latest album and the name of this tour. She kept the energy rolling with songs like “I Wanna Be Like Me” and “Love Song”. She was also so great with audience interaction. She complimented the audience about their energy, saying she didn’t need to do anything, we were all ready to go. She made a joke that maybe it was the smell that was firing up the crowd. For those who have never been to The Great Saltair, it is right on the shore of the Great Salt Lake. And the sweet sulfury smell of the lake is as much a part of the show as the bass player. I like to use this amazing odor to gauge how the show is going. If it’s not a very good concert, that smell gets worse. And if the show is great, the smell becomes almost unnoticeable. Well about a third into the show, you could have sprayed perfume on me, or lake water, and I wouldn’t have even noticed. Sara was just that good. She treated a good part of the show as if it was a VH-1 “Storytellers” episode. Telling us of her recent move from Los Angeles to New York, the heartache of ending a long term relationship, and how these songs were written in regards to those events, and at what time. I don’t think I have ever seen someone work an audience quite like Sara Bareilles. Her banter is as quick as a stand up comic being heckled. She really is hilarious. I was laughing really hard at times. She also has a way of putting you right there in that moment with her when she wrote that song. It takes a lot to visualize a song; To picture everything happening as if you were there. But she makes it so easy. There was a great part of the show where Sara performed alone with either her piano, or a guitar. I felt like I was in a living room with a few friends watching her perform for just us. It wasn’t until the song ended and the crowd was much louder than just a few friends, that I was brought back to where we were. Sara debuted a new song that she has written for a Broadway Musical named “She Used to be Mine”. She is doing the music for a stage adaptation of the film “Waitress” starring Kerri Russel of “Felicity” fame. If the rest of the songs in this musical are anywhere near as good as this song, this musical will be a hit. Once again, we were taken from the concert stage, to the Broadway stage in our minds, and could visualize the staging of this show, just from how good this song was. I can’t wait to hear the rest. Now as much as I love Sara’s cover of Coldplay’s “Yellow”, I was even more impressed with her cover of Sia’s “Chandelier”. I mean, wow! Her range is incredible. The girl performed just the night before in Denver. How is she hitting these notes on back to back nights? I was seriously blown away. The audience was excited to hear the cover, and then when she killed it, they were anxious to give Sara her due applause. People next to me were commenting on how amazed they were. One nice girl next to me said, “I never thought I could love a version more than the original. But I love this so much, I think I’ve changed my mind!”. Sara concluded her main set with a string of her biggest hits. A song that is sure to be heard at wedding for years to come “I Choose You”. I try to never video songs while I’m at shows because I like to be in the moment. I might film a minute here and there, but I’d rather be in the present then watch it later on youtube. But for my faithful readers, I decided I would record this whole song, so that anyone who hasn’t seen Sara Bareilles live, would get an idea just how amazing she is. She followed this with a crowd favorite “King Of Anything”. I really like this song, but for a minute there, I felt like I was at a man haters convention. These drunk girls were singing the lyrics in my face as if I was their horrible ex boyfriend. It was pretty funny actually. But when things settled down, everyone was united in a great sing along. Sara finished this run with her now biggest hit, “Brave”. The audience was taken to a new high, and the volume of their singing almost eclipsed Sara’s voice at times. She finally just gave the crowd their moment to sing the chorus, and sing they did. PS-It’s really hard to sing at a concert where there are mostly women. I tried singing along, and I felt like my voice could be heard for at least 4 rows. So I let the ladies have their time and kept my singing to myself. Sara came back with the three women in her band and did a four part harmony a capella version of “Bright Lights and Cityscapes”. To be able to quiet down a crowd of 2,000 people to sing a song a capella is not small task. But we shouldn’t be surprised to know that she did it. Sara did it. It was silent in there. The harmony’s were perfect, the song was beautiful, and it was a perfect moment for the once frenzied audience. She closed the show with “Satellite Call”, and then that was it. She was off. Ready to hit the road to entertain and inspire another anxiously awaiting audience. I had seen Sara in concert once before this. But she was opening for another band. She sounded great, the crowd enjoyed her, but there is something to be said for when the show is your own. The setlist was as long as she wanted it to be. The lights were her lights. The staging was hers. It was her show, and she completely owned it. I love seeing artists in the prime of their career. The fans are still excited about “new stuff”. The music is fresh, and packs an impactful punch rather than reflections of nostalgia. This was Sara Bareilles live in the most perfect way. 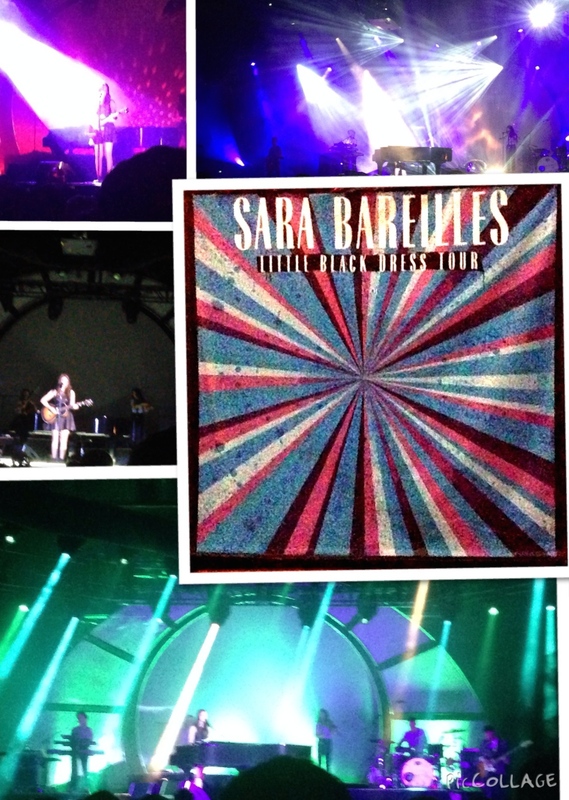 Fan or not, man or woman, I cannot recommend seeing Sara in concert more. You won’t go home disappointed. It’s impossible. You’ll be impressed by her voice, you’ll convert to a fan of her seemingly “for women only” songs, and you’ll be guaranteed a hard laugh. What more do you need in a night? There is such an interesting dynamic to a free concert. For starters, not everyone is necessarily a fan of the band performing. Many times they are just there because they didn’t have to pay for it. 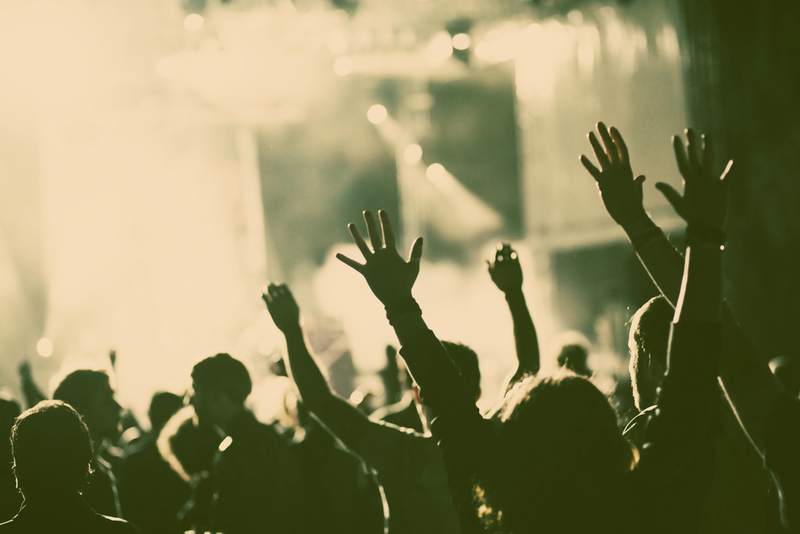 Free concerts are generally not held in typical concert venues, which lead people to be confused at what type of concert this will be. Do they bring their own seating or blankets? Is this a stand up show? Is this even my kind of music? 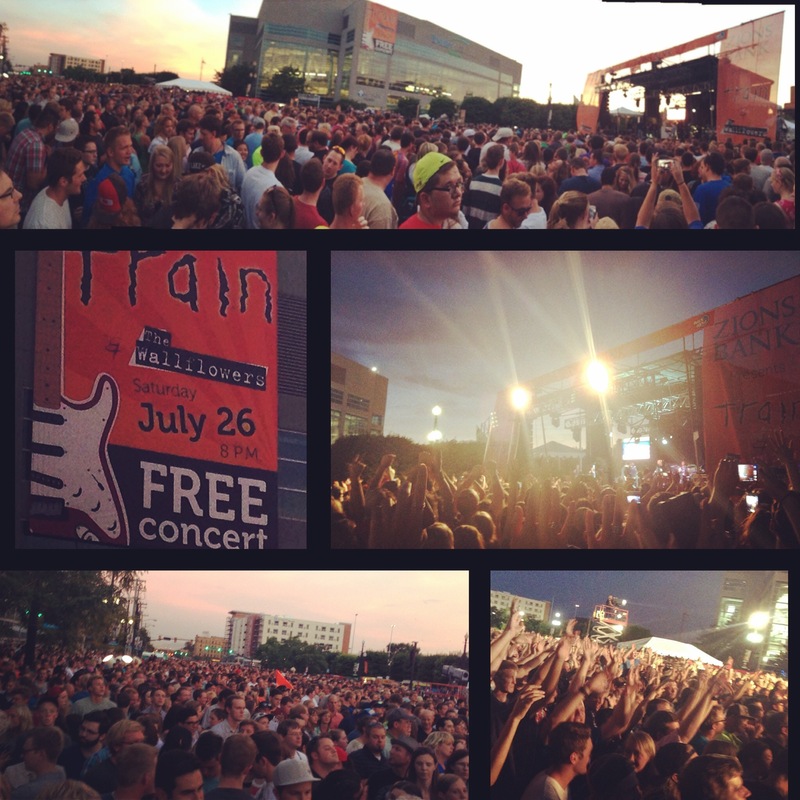 This past weekend I was able to observe all of this at the free Train concert in downtown Salt Lake City. The concert was performed in the shadow of Energy Solutions Arena on a closed off 300 W block. The crowd was diverse. Well, this is Utah, by diverse I should clarify by saying there were people of all ages at the show. Some were confused, and brought their lawn chairs and blankets as close as 30 feet from the stage. Maybe Mix 107.9, the radio station that hosted the event, should have announced this wasn’t a concert in the park, it was a show in the middle of the street where people would be standing the whole time. Anyway, these people were bummed once this concert started. I imagine they either couldn’t see, had their blankets trampled, changed locations, or closed camp and stood like the rest of the throng. I always feel the need to divulge my level of interest in the particular bands I review. To be perfectly honest, I’m not a Train fan. Although I do respect them for their longevity, and their success in the music business. I found it surprising that a band that could probably fill the building next door on their own tour, was willing to play a free show to close the “Days of ‘47” celebration and Pioneer Day weekend. Don’t get me wrong, I’m sure they were paid handsomely and I overheard some mega fans state that some band members have property in Park City. If this is true, it was an easy payday, and easy commute for the band during what appears to be their touring off season. It was fun to see die hard fans in pure bliss that they were seeing their favorite band for free! But there seemed to be a fun atmosphere in the air, that we were all there for a good time, with a band, fan or not, whose songs we know whether we want to or not. The show was opened by mid nineties “one hit wonders” The Wallflowers. For me, this was a great choice for an opener. They are a band I’ve thought might be fun to see, but I don’t know that I would make it a point to go to their show. The thing with most “one hit wonders”, they actually have more hits than the one. The Wallflowers opened with “Three Marlenas” which was actually a hit for them. They also played “6th Avenue Heartache” and, “The Difference”, both hits for them. But let’s be honest, if we’re going to see The Wallflowers, we want to hear their big hit “One Headlight”. And of course, they did not disappoint. Sometimes I feel for these bands, because they probably have other good songs that they would love to play. But at the same time, I know tons of artists who would give anything to have just one hit. So, I don’t have too much sympathy for them. They’re still doing shows almost 20 years after that song came out. There was a quick turn around with a DJ from Mix 107.9 coming out and preparing the crowd for Train. He noted that there were more than 20,000 in attendance. When I looked behind me, I couldn’t see the end of the crowd. It looked like people went on for forever. Train came out strong opening with one of their hits “Calling All Angels”. This was a song where fans and people like me, just there for the experience, could get into. The crowd was immediately into this show. To me their only misstep was trying to cover Led Zeppelin’s “Ramble On”. I’m sorry, but that is just too far of a reach for me. And I don’t think the crowd loved it either. But we moved past that musical blasphemy, and got back on track. They returned to their hit list with what I believe was their first big hit “Meet Virginia”. The thing that has always impressed me with Train, is the fact that when you think they’re done producing radio friendly hits, they’re not. When I heard “Meet Virginia” back in 1999, I thought this was a group that would be popular until about 2002, and then they’d ride those hits the rest of their career. But here we are in 2014, and they’re still releasing songs that will most certainly chart. Which was proved when they sang a yet to be released “Bulletproof Picaso”. The way the crowd reacted to this new song, I’m certain I’ll be hearing it for years to come at my local grocery store. Above anything else, Train are the consummate professionals. They know just how to entertain a crowd like this. They knew not everyone there were Train fans. Lead singer Pat Monahan did a great job interacting with the crowd. After the first song he jumped to the security aisle and told everyone along the aisle to pull out their phones and he’d let them take selfies with him. PS-Selfie is such an awful word! I imagine he does that at a lot of his shows, but it was clear to me that the crowd, even those no where near the security aisle, were excited at the thought. He also brought up about 20 or so girls/women during the song “Mermaid” to be his backup singers. He brought up a young girl to sing “Bruises” with him. Again, all of these things may be done at all of their shows. I wouldn’t know. But like I’ve always said, when playing a show in the middle of the street, best to interact with and involve the audience. The main set concluded with monster hits “Hey Soul Sister” and “Drive By”. Young and old alike at this show were singing along, and waving their arms in unison at Pat’s command. Train came back and sang “Marry Me”, which I’m sure reminded many of their first dance at their wedding, or opened the door for some sweet public making out that never makes anyone in close proximity uncomfortable. They couldn’t do a show without performing their enormous hit “Drops of Jupiter”. The sing a-long was defining. It was irresistible not to join in. They closed the show with an interesting choice. They ditched their songs to perform “Dream On” by Aerosmith. After just experiencing what I believe was a failed attempt at Led Zeppelin, I was nervous as to how this would go. But to the general public, this song is probably more well known these days. And because this was done during the encore, Train could have probably performed “Hangin’ Tough” by New Kids on the Block, and the crowd would have been in just as much of a frenzie. Come to think of it, I really wish I would have heard that! Anyway, Train did their thing with the song. The crowd was way into it, the band sounded great, and Pat Monahan actually killed it. He it all the notes you have to hit to make that song rad. I was actually impressed. As someone who isn’t a card carrying member of the Train fan club, I walked away more than satisfied with the show. As I mentioned, they are true professionals. They came to entertain a crowd, and entertain they did. Their fans were happy, people just looking for good times, found it, and even when I asked a friend who doesn’t like Train at all what his thoughts were, he said “It was well put together.” I admire a band, who can come out, and perform successfully to a crowd that isn’t theirs. So for that I say choo choo Train. Choo effin Choo. It was time once again to head to the USANA Amphitheater to spend another beautiful July night in double headlining, legendary rock band euphoria. USANA was packed as much as I’ve ever seen it. So packed, I didn’t see a patch of green in the lawn seating. Tonight’s leaders of fist pumps and rock fingers were first The Steve Miller Band, and bringing it home was one of the all time greatest hit machines, Journey. Tower of Power opened the show, but I missed them. But all accounts were that they sounded as good as ever. To be honest, I was surprised that this was a double headliner. Yes, Steve Miller Band has tons of great songs, and a fan base that has lasted and rivals many if not most of it’s contemporaries. But when I think of Journey, I think of hit after hit, and sing a long after sing a long. Not to mention the fact that “Don’t Stop Believin’” is the most downloaded song of all time. That, as well as appearing in the finale of “The Soprano’s”, gave Journey a new life in the new century. But finding their current lead singer, Arnel Pineda, on YouTube, and the story that goes along with that, has kept Journey far above any other band in their era. https://www.youtube.com/watch?v=yKv93LcfLOI But tonight, we were back in a time where Journey, and The Steve Miller Band were playing the Fillmore in San Francisco and both were each other’s equal. Initially The SMB was treated as if it was the opening act. The sun was still out, people were sitting down for the most part. Steve didn’t seem to mind. I really enjoy The SMB. They are one of those bands that have way more hits than you realize. They opened the show with about 4 huge hits. The crowd seemed pleased to hear these classics. I was concerned thinking, ‘He’s playing all his hits early, he’s going to run out of songs!’. But as I mentioned, he has way more classic stadium anthems than I realized. After the obligatory slow jam portion of the show. When that was finished, Steve and his band kicked it into high gear and finished the show with even more huge classic hit songs. I would say out of the 18 song set, I knew at least 12. I’m a greatest hits fan of The SMB. I’ll admit it. So to know more songs than I thought I would, was a pleasant surprise. The crowd finally rose to their feet when Steve Miller put on his spaceman mask and sang “Space Cowboy”. It was the highlight of the set for me. And because they were co-headlining they came out and did an encore. As the sun was going down, the energy was up for The SMB. They ended the show strong, and the crowd was ready for Journey. About 20 minutes later, Journey took to the stage. They hit the crowd with about 5 huge hit songs. It was almost as if the crowd didn’t know what to make of hearing these songs so soon. Songs like “Anyway you want it”, or “Separate Ways”, or “Only the Young” were blasting through our ears and into our brains before we knew what to make of it. They were in top form. One of Journey’s shows earlier in the week had to be canceled due to inclimate weather. This gave Arnel an extra night of vocal rest. Honestly, I don’t know how that dude sings those songs 3-4 times a week. He was in his usual top form, running all over the stage looking like he was twenty years younger than the rest of the band. He’s only about 10 years younger. Spirits were high, and voices were united in these familiar songs for a solid forty minutes. Then the middle of the show arrived. Now don’t get me wrong, I get bands wanting to do newer songs. Especially when they’ve been playing the same stuff for 30 plus years. But something felt weird about this middle segment of the show. They would play a new song, or a deep cut, and then attempt to keep the crowd interested with a piano medley of songs that were otherwise unplayed. Instead of being interesting, it mostly bummed me out that I wouldn’t be hearing some of these great songs of theirs. They got the crowd’s attention by getting back into their classic catalog and mixing in “Lights” and “Open Arms”. The crowd joined in these sing alongs as it’s some of their biggest songs, but the audience had been figuratively sitting on their hands for the better part of a half hour when we finally reached this point. The band then jumped back into some newer jams, and the crowd for the most part was not along for the ride. Brandon Flowers, the lead singer from one of my favorite bands The Killers, when asked why he was doing a solo album when the rest of the band was taking a break, said something to effect of, most bands have a ten year window, give or take, where fans are interested in hearing new music from them. After that, they only want to hear “the hits”. So he wanted to release as much music in that time as he could before he was relegated to a “hits only” act. Even if sometimes the newer stuff is great or even better than what made the band big, the general fans don’t want that. After reading that interview, I have always paid attention to this philosophy. And you know what, he’s right. And so it goes with Journey. When they had their decade or so, they released hit song after hit song. A streak matched by very few. So when it came to performing songs not within that framed decade, the crowd was generally uninterested, and seemed eager for a return to the songs they hoped to hear. They actually had some pretty decent new songs. Well, at least songs that sounded like Journey songs. But no one wanted to hear them. And as a fan, I’m right there with the other 20,000. I want to hear the songs I grew up on. The songs that made a comeback when I was in high school, and Journey released their Greatest Hits album, which reminded us that they existed, and that they once dominated the charts. But at the same time, I can see how this could be frustrating for the band to be held to past success without given a chance to show what else they can do. Finally the crowd was resurrected when Journey played “Wheel in the Sky”. From there they played a few more big songs and then, as if nothing ever happened prior to this moment, they played “Don’t Stop Believin’”. No matter how many hits they have, and no matter how many new songs they tried to squeeze in, when that piano intro hits the ears, it’s like the world stops and all focus is on this one moment. It’s amazing how a four minute song can feel like an eternity of awesomeness. That was the moment, and the reason to be there. They must have played that song thousands of times over their career. But there is just no way it can get old. To see a crowd in that state of frenzy is a feeling I can only imagine, but one that they see every night. It must be so amazing. The band left and then of course came back for the encore. They finished the show with one of my favorites “Lovin’, Touchin’ Squeezin’”. The crowd was still at it’s peak. It was strange. It was almost as if the show was just getting going, and yet, unfortunately this was to be their last song. I’m not sure if it was the order of their setlist, or too many new jams, but with that middle portion of the show bringing things to what felt like a stand still, the night left a little to be desired. That being said, it was a fun night of overall great music. The people watching wasn’t a let down by any means either. It really is one of my favorite aspects of attending concerts. 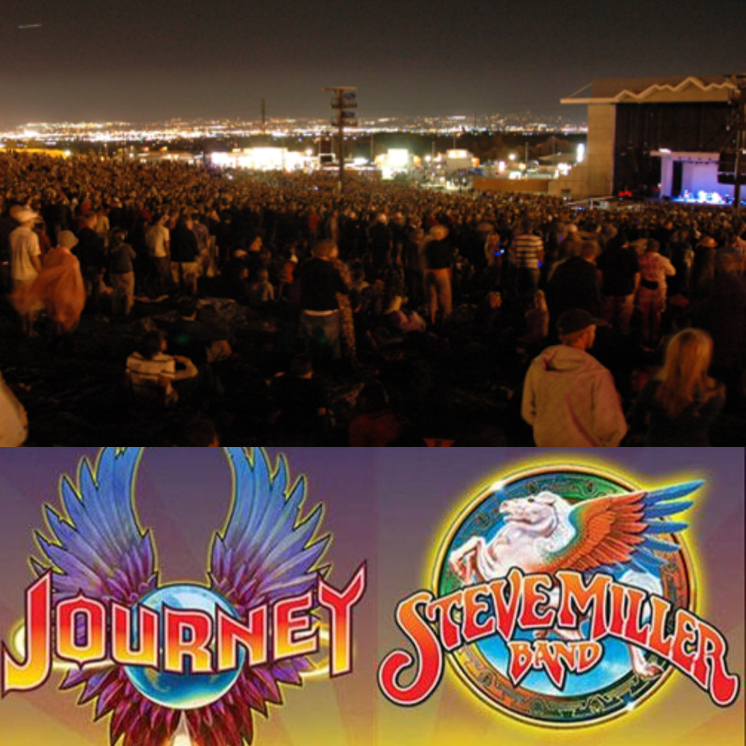 It’s hard sometimes to not wonder how much more amazing this night would be, if we could see Steve Perry back in his rightful place as the lead singer of Journey. But I feel like we are dealt this hand as Journey fans, and if we have to see a replacement singer, I’m glad it’s Arnel Pineda. He keeps the show alive, and exciting. Without him, there would be a lot of 50 year olds just standing there. They do sound fantastic, but Arnel makes a Journey show still worth going to. Summer is here! And so begins this year’s shows where many historic rock bands are teaming up to tour the USA. The first of these shows was last nights epic evening with the opening night of the Kiss and Def Leppard 40 night Summer Tour. The show began promptly at 7pm with Kobra and the Lotus opening the show. The generally uninterested crowd livened up when they burst into a cover of Heart’s “Barracuda”. Smart move. Def Leppard would be the next band to take the stage. But before they did, several veterans and current soldiers stationed at Hill Air Force Base presented the U.S. flag and the audience rose to their feet while the soldiers and vets sang the national anthem. As it turns out, proceeds from this tour will go to helping the Wounded Warrior Project, which helps meet the needs of soldiers hurt in battle. KISS and Def Leppard hired one veteran each to be a roadie on this tour. We were introduced to these new hires, and they were received with a roaring ovation. Now, I want you to know the point of view I’m coming from when concerning these two headliners. Def Leppard was huge when I was in elementary school. There wasn’t a day that went by, where someone wasn’t wearing Joe Elliot’s iconic Union Jack sleeveless shirt. They stayed popular until the beginning of my high school days. Therefore, I knew all their hits, whether I wanted to or not. KISS on the other hand were a little before my time. Gene Simmons “Demon” character used to scare me when he would do his legendary coughing up blood routine. When I reached high school, KISS was past their no make up phase, and had returned to their classic look. But KISS wasn’t really considered cool in my high school days. I come from the time when Nirvana showed up, and changed everything. Only the true head bangers stayed strong in the KISS Army. My association with KISS is seeing them as greedy business men looking to sell merchandise more than their music. Gene Simmons to me always just seemed to be a slime ball with a random reality show with somehow really well adjusted kids. So when this show was announced, my interest was to see Def Leppard and hear all the hits I once knew. I was less interested in seeing KISS, but I felt like they are such an iconic group, it seems like a band I should see at least once. So, as final preparations were being made for Def Leppard’s appearance, The Who’s “Won’t Get Fooled Again” was playing on the PA. Generally before a band takes the stage, a song will play and gradually get louder signifying the start of the show. Once the song ends, the band comes out. I was fully expecting this formula when Def Leppard mixed things up! Just as I thought the song would be fading out, the curtain hiding the band was quickly sucked away and there they were, Def Leppard in all their glory! And they continued playing “Won’t Get Fooled Again” where the recording had left off! I loved it! The crowd was in a rage right from the get go. The sun was still out and was shining on the stage, so we weren’t able to see the digital screens just yet, so the band was left to their own devices. They were all over the stage, keeping the crowd fired up. It’s amazing, these guys have played many of these songs for 30 years. But the thing I like about Def Leppard is they play these songs with the type of energy that would lead you to believe they had just released these songs. Now, as if it was scripted, just as the sun was setting, they slowed things down with a couple rock ballads. They added a special twist with an acoustic version of their hit, “Bringing on the heartbreak”. At first I thought they went with this version in order to preserve Joe’s voice. But at the end of the song, they switched to the original version, and he hit all those high notes just fine. They closed the main set with “Armaggedon it” and of course the peak song of the set “Pour Some Sugar On Me”. Sometimes it’s hard to get the crowd going when it’s still light out, but this could have been the final song of the whole evening with the way the audience was responding to this song. They were singing every lyric at the top of their lungs and throwing their fists and rock n roll signs in the air. It was easily my favorite moment of the evening. 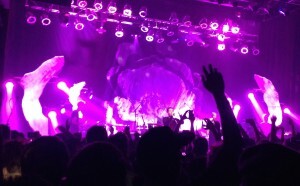 They returned to the stage to perform their final two songs “Rock of Ages” and “Photograph”. They left the audience in a frenzy, and already hoping they would come back to town soon. Def Leppard understands the formula for putting on a great rock show. They would be a tough act to follow, and honestly, I don’t know how KISS is going to do it for 40 shows. After about an impressive 20 minutes of roadie work, KISS was set to take the stage. And did they ever take that stage. When their curtain fell, we saw the band lowering from the top of their light rig, which was designed in the form of a spider. This came as no surprise, as KISS is known for their spectacular staging. 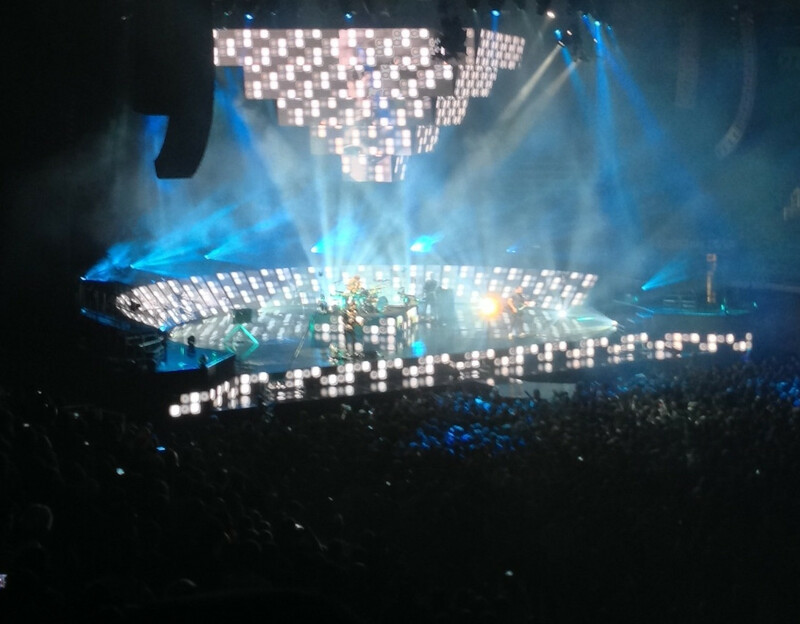 From the start, the show was filled with fireworks, crazy lights, and pyrotechnics. As I stated before, I’m not a member of the KISS Army, so I only knew a handful of songs. But the thing I liked, is they seemed like they were having fun. Paul Stanley seemed elated to announce to the crowd of over twenty thousand, that this show broke the USANA Amphitheater attendance record. I must say, it was kinda cool to be part of that kind of history. Despite knowing how they sell everything possible with a KISS logo on it, (Including coffins!) and how it seems they focus on making money more than music, it was fun to see them in their true element rocking on stage. I wonder sometimes if they wish they hadn’t ever come up with the gimmick of wearing that make up. Or if they realize, they may have never made it if they didn’t dawn the “Demon” and “Starchild” look. I say this because throughout the show, KISS did some of their trademark live show routines. For example, Gene Simmons did his breathing fire routine, and his once upon a time, scary to me, coughing up blood routine. Paul Stanley ziplined to the middle of the amphitheater to perform a song on a mini stage that had been set up. Gene Simmons was lifted to the top of the amphitheater for a song, and at the end of the show the whole band was lifted up on huge risers. For what they lack in awesome songs, (my opinion only), they make up for in stunning visuals that rival no one. When I’m attending a show where I’m not a die hard fan, I like to look around me, to try to get a better point of view of how the show is going. I don’t think it’s fair to just send out my opinion when the band is there for their real fans. So I like to get a perspective on how they are reacting. This was a very interesting discovery. There were fans who knew what was about to happen, so they would tell their friends, “Oh, this is where Gene does…” or “Paul always does this.” and so forth. I would hate to attend a show with that guy. It’s like seeing the band Journey with someone who has memorized the setlist from past shows, and right before “Don’t Stop Believing” comes on, the guy next to me says, “Hey, they’re going to play ‘Don’t Stop Believing’ right now!” Seriously dude?! Not Cool! So anyway, enough of my past live show trauma. The fans that spoil the iconic routines are annoying. Don’t do that. It’s better to see the person surprised than give it away. Trust me. There were also the fans who had never seen these routines by KISS. Apparently they were raised in the wilderness with no television or pop culture magazines. But it’s fun to see the looks on their faces when Gene is spitting fire, or Paul is zipping his way across the crowd. Then there are the fans that know what’s going to happen, they’ve seen it a hundred times, and yet, they still absolutely love it. In my opinion, that is the true KISS Army. USANA Amphitheater was their church, and they came to worship their rock gods and observe their rituals. That made the show great for me. I love seeing fans happy to get what they came for. 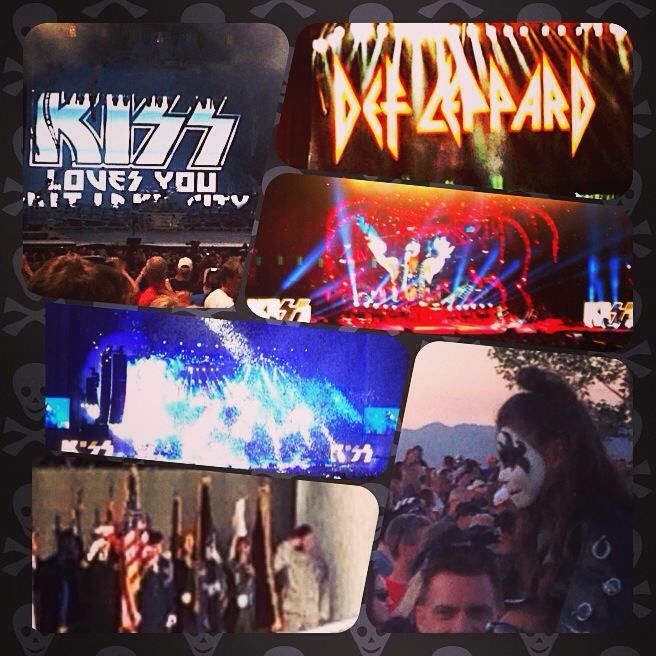 Due to curfew constraints KISS didn’t go off for an encore, they just played through to the end of their set. It felt a little less rock n roll to hear that, but I respect them for being cool, rather than sticking it to the man. Sometimes, the man needs a break from all the sticking it to him he’s getting. They closed the show with their enormous hit “Rock and Roll All Nite”. The pyro was going off, the fireworks were going off, about 8 billion, zillion, cagillion, strips of confetti was flying through the warm summer sky! It was as if it was the last song, of the last show they’ll ever do. And yet, no, this was the first show, of their 40th Anniversary tour. I was offered a ticket last minute to see The Naked and Famous last night, and I’m so glad I was able to go. What a fun band. I’m a huge fan of synthpop, so this show was right up my alley. I think it must be so interesting for a band from far away, in this case New Zealand, to come all the way to our small rocky mountain city to find a high energy fan base such as this. The Depot was sold out, the fans were dancing, singing and jumping the entire show, and it was obvious that the band was loving it. They made several comments as to how lively the crowd was. The interesting thing about The Depot, is while it’s a great venue as far as the sound, visibility, and size, sometimes it seems fans will treat the place like it’s the local pub, and the band is just some local act. It has always amazed me when people act like this. Well not tonight. Sure, people had their drinks, and conversed at the bar, but not for too long. Most of the people I observed were anxious to get back to the show. And I can’t blame them. The music was fantastic, and the vocals were perfect. The Naked and Famous aren’t the type of band to dance around, and interact with the fans too much. But their music speaks for itself. Personally I don’t know how they’re not dancing the whole time. I couldn’t stand still at one of their shows, even if I had a broken leg. The nice thing about the band is they picked their spots when to really get into it. And the crowd always followed along. As was expected, the final song of the night was the hit Young Blood. For me, seeing a band that is on the rise, with maybe one or two big hits, as opposed to seeing a hit machine like The Eagles or U2, has a certain appeal. While I love seeing bands with a ton of hits, there is a certain exciting anticipation when waiting for those two or three big songs. And that was definitely the case with this show. When Young Blood began, there was an excitement level from the crowd that had not yet been present. It was almost like a release from the almost 90 minutes worth of anticipating when we were going to hear it. And I gotta admit, it was worth the wait. It really is a great song. The Naked and Famous have played that song so many times! And they will have to play it in so many shows to come. But even they seemed to love the moment. How could they not. All in all, it was a fun night. And while I personally felt like I was chaperoning the concert due to the youth of the crowd, it was still a great show, and I’ll be sure to see them again. 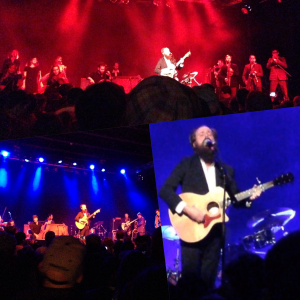 In the summer of 2012 I had the opportunity to see Iron and Wine as part of Salt Lake City’s summer Twilight Concert Series. While I enjoyed the show for the most part, I couldn’t help but feel that I wasn’t seeing this band in its proper element. Seeing them at In The Venue on November 6 was much closer to the setting I had in mind. Now I must say that I’m not a die hard Iron and Wine fan. I do like the music, but for example, I haven’t been able to track down a set list for this show, and I can’t name one song he did other than his infamous cover of the Postal Service’s hit “Such Great Heights”. Now I’m sure this makes me pathetic to actual fans of the band, but with all this being said, I feel like my review has some insight to offer that the typical fan might not experience. While In The Venue, is a much better location than Pioneer Park, I still felt like a theater setting might be best for this show and style of music. Perhaps seeing him at Kingsbury Hall would be the perfect place. It’s not a matter of sitting down or not. Trust me I have stood for some pretty lengthy shows and didn’t mind it in the least. I just feel like a theater would set the proper tone for this band. Now let’s get something else out of the way. Can somebody help me please? Should I refer to Iron and Wine as they, them, or him? Because it seems to me that Iron and Wine for all intents and purposes is 100% vocalist, guitarist, and songwriter, Samuel Beam. So I’m going to call Iron and Wine, “he” until someone corrects me. With that being said, Sam was joined on stage with a full band matched up in Threes. Three female backup singers, a three person horn section, and a three person string section. It was if the band had been cast in a movie about an indie folk band. All of them had their own personalities that stood out, and all of them seemed as if they had their own tale to tell. These nine musicians along with a drummer, bassist, and Sam filled the night with so many styles of music, and so many sounds, that my ears and mind don’t have a way to truly process what I heard at times. But it was beautiful and kept the two hour show full of surprises and anticipation. As someone who again, wouldn’t consider himself a diehard fan, it was fun to watch the audience throughout the show. Usually in a show, I’m looking forward to what’s next; what great hit song am I going to hear after this one. But I didn’t have any anticipation. I just loved seeing individual faces light up at different times when they heard the song they came to hear. And I was able to enjoy the song for the song. Many of which I had heard for the first time. I was able to be in the moment for once, rather than wondering what was next. Because chances are, I wouldn’t know the song anyway. A show like this really gives Sam the opportunity to engage with the audience, and show his personality a little more. Being a smaller venue, it seemed as if the crowd felt like they could talk with Sam and the rest of the band like they knew them. In between songs many people would shout out the song they wanted to hear. I’m not sure if this is common at an Iron and Wine show or not, Sam seemed un-phased by it. I thought at this point Sam showed his brilliance as much if not more than when he played his amazing music. Being a Southern man, Sam was always polite, and I loved how as people shouted out their requests he would say “Thank you, Thanks, Thank you”, which was basically saying, “Thanks for liking my songs, but we’re not doing that one.” True genius in my book. Be grateful, but continue with what you came here to play. I’d say my favorite part of the night was when someone from the crowd shouted the obligatory “Freebird” when requesting a song. It’s is a long running joke for concert goers to request Lynard Skynnard’s classic hit. I don’t know where this started, but it’s been going for ages. It seemed pretty strange that this request/joke would happen at an Iron and Wine show, but nevertheless we were not immune to the attempt at humor. But where the real joke rested was with Sam. He seemed to smirk and ignore the request and begin one of his songs. But what we were all surprised to hear was Iron and Wine actually singing, “If I leave here tomorrow…” the opening lyrics to “Freebird”. The audience roared with laughter and applause, totally satisfied with this being the punch line to the joke. I truly hope I can paint this picture correctly because Sam was the one with the last laugh. So with the crowd amused with the moment, they seemed satisfied to move on to some more Iron and Wine songs. But Sam kept going. He sang this southern rock gem in his style, full of depth sincerity and purpose. The audience’s demeanor changed. They were now fully engaged in the piece. Now right at the point where the audience was moved beyond any other point in the show, Sam pulls up and says, “Just kidding.” There was a collective reaction from the audience that basically said, “We’ve been had”. As an outside observer, I thought it was hilarious, but more than anything, I realized that Sam had that much power over this audience. He could take them anywhere and they were willing to follow. And he did. He took us to places musically most of us were not prepared for. He took us to familiar favorites like the previously mentioned “Such Great Heights”. And he led us through a night I won’t soon forget. My overall experience was excellent. From the band, to the specific small moments I noticed throughout the crowed, to the reason we were all there. The music. I would highly recommend seeing Iron and Wine live. In my opinion, the live version of any of these songs by far trumps any studio recording of his. I was honored to be a guest at this incredible event. Brian Stokes Mitchell has been dubbed by the New York Times as “Broadway’s last leading man.” After seeing him on November 2, 2013 at Abravenal Hall, this is a difficult thing to deny. I had the opportunity to see Brian Stokes Mitchell in Ragtime in its pre-Broadway run in Los Angeles and I knew there that I was seeing a Legend in the making. I’ve also had the privilege of seeing BSM in his Tony nominated performance in The Man of La Manchia. Now, I have seen a countless number of musicals in my day, with many a Broadway legend. But only once have I seen a show stopping number actually stop the show. This was following Mr. Mitchell’s powerful rendition of “The Impossible Dream”. For at least two minutes straight, the audience stood and applauded while BSM stood there frozen in character. If two minutes doesn’t sound like a long time, clap for two minutes straight and you’ll get an understanding of how long that is and how special that moment was. I was also able to see Brian Stokes Mitchell perform as Javert in the All-Star cast performance of Les Misérables at the Hollywood Bowl. But seeing Brian in his own solo show was truly the ultimate proof that he is “Broadway’s last leading man”. I had only been to Abravenal Hall once, and it was to see a Warren Miller ski movie. Now while I enjoyed the film, it was nice to experience this great orchestral hall in the way it was intended. The acoustics in Abravenal were amazing. I think Brian might have been able to perform without a microphone and everyone would have been able to hear him just fine. In my opinion, Abravenal Hall truly is the finest of Utah’s performance theaters. The concert began with the Utah Symphony performing a medley from Cole Porter’s Kiss Me Kate. While the Utah Symphony was masterfully conducted by Jerry Steichen, I could sense an eager anticipation for the arrival of Mr. Brian Stokes Mitchell. The moment finally arrived and Conductor Steichen introduced Brian as the audience applauded with a smattering of people even rising to their feet. Brian opened the show with the Broadway classic “Some Enchanted Evening” from the Rogers & Hammerstein smash hit South Pacific. And things really took off from there. Now I don’t intend to review this show song by song, you can look at the set list below to understand how amazing this night really was. What I do want to mention is how well Brian knows his audience. He did several songs in character, but most of the songs he sang as himself. He told stories of why he was doing a particular number, or how he was given the opportunity to perform of some of his most famous roles. He sang some of Broadway’s greatest songs as well as songs most people might not have heard of. He really put together a great mix of songs to keep the audience on a constant high. He was passionate about the songs he was singing, he was moving in his stories, as well as humorous. He was gracious to the audience and mentioned several times how much he has loved performing in Utah over the years. There were four particular highlights for me. The third song of the night was “Stars” from Brittan’s longest running musical Les Misérables. Brian’s posturing, and powerful voice put me right into the center of that musical, and I could see Javert the determined police officer desperate to seek out Jean Valjean, the man who broke his parole many years ago. Several audience members rose to their feet at the end of this number. Another was a song written by Maury Yeston known mainly from his musicals Nine and Titanic called “New Words”. The song depicts a father teaching his son a new word each day. I have never heard this song before, but while BSM was acting out the song, I felt as if his own son was right there listening to his dad. It was a simple song with a powerful message, and beautifully performed. Towards the end of the show, Brian spoke about two songs he’d be doing together. He talked about how the country had fallen upon hard times and how sometimes the “American Dream” can seem lost. But that it’s always important to have hope. He then sang an acapella rendition of “America the Beautiful”. Brian’s voice echoed through the hall in a way that only his voice can. As I mentioned the acoustics in Abravanel Hall are fantastic. In our day and age there is something to be said about captivating an audience. No one spoke, no phone was heard. All eyes and ears were on Brian as his voice spread thought the venue. It was a moving moment. As the song began to end, the Orchestra began their intro to “Wheels of a Dream”, on of Brian’s most notable songs from Ragtime. The commanding performance of these songs together left the audience moved to tears as well as enthusiasm. When he was finished the crowed rushed to their feet. Finally, the song I had personally been waiting for. “The Impossible Dream” from Man of LaManchia is one of my favorite songs, and Brian Stokes Mitchell’s version is by far the best that has been done. It is no surprise that he did not disappoint. He sang each word with the meaning these lyrics deserve. The audience was inspired and again a standing ovation was in order. The show ended with Brian coming back and singing the Louis Armstrong classic “What a Wonderful World”. This set the perfect mood to send the audience home hopeful and peaceful after a great night of music. If you have never seen Brian Stokes Mitchell live, I highly recommend you put him on your list of people to see. Sometimes performers just go out and do their job. Perform. But Brian Stokes Mitchell makes his concert and experience. He appreciates his audience and he understands the honor it is to be a performer.